Allosteric regulation of proteins is often examined using two different models. The widely-known “induced-fit” (IF) model proposes that effectors form a loose complex with inactive proteins and cause them to shift into a new, active conformation. In the competing “conformational selection” model, effectors bind to and stabilize proteins that are already in an active conformation. An upcoming paper in the Journal of the American Chemical Society examines this question in the case of T. lanuginosis lipase (TLL) (1). The data show that the enzyme enters an activated state even when it is prevented from interacting with its activator. While this strongly suggests that the activation mechanism is CS, some data suggest that the mechanism is actually IF. The paper in question relies on single-molecule kinetics techniques to characterize an enzyme. Previous studies in this field have shown that reaction time varies between enzyme molecules and over time for single molecules. These findings should not surprise us, knowing as we do that all machines have intrinsic variation in their rates of operation. Flexible proteins that can adopt many different folded structures (not to mention partially-folded and unfolded ones) should be expected to have even more operational differences. That said, there are a variety of ways to account for the observed distribution of reaction rates. TLL is activated by lipid membranes. While tracking the activity of individual enzymes using fluorescence, Hatzakis et al. altered their ability to access a lipid membrane by changing the concentration of polyethylene glycol (PEG) in the solution; PEG blocks the (tethered) enzyme from accessing the liposome. They found that a model where the enzyme exists in an equilibrium of active (R) and inactive (T) states is most consistent with the distribution of reaction times they observe, even at PEG levels that completely occlude the membrane. Based on this finding, they conclude that TLL activation occurs by selection of an active conformation from a pre-existing equilibrium, rather than inducing a new conformation. At this point things start to get a little confusing. The central problem is that CS and IF are used to identify both characteristics of the apo- ensemble and features of the activation pathway, and the former don’t necessarily coincide with the latter. To understand what I mean, take a look at the figure below. Here, Ta and Ra are ligand-free T and R states, while Tb and Rb are ligand-bound T and R states. The typical ligand-free state is Ta, and the allosterically activated state is Rb. Ra (apo-R state) and TbL (“encounter complex”) are thermodynamic states that are viewed as characteristic of CS (red path) and IF (blue path), respectively. The rates kact and kin are the apparent rates of activation and inactivation, which are dependent on the microscopic rates noted for each pathway. In a CS mechanism, the protein adopts both the R and T structures while free in solution, and ligand binds preferentially to the R state and stabilizes it, redistributing this pre-existing equilibrium without creating “new” states. Because binding follows conformational change, a pre-existing equilibrium in the apo- ensemble is a necessary condition of CS. In the IF case, binding precedes conformational change: the ligand encounters the free T structure and allows it to adopt a “new” R structure. Traditionally, this has been interpreted to mean that the R structure never exists in solution at all. However, binding may proceed by an induced-fit mechanism even if an R state is populated in solution. There are a couple of cases where we know this must happen. For instance, adenylate kinase, a protein that I have discussed before, undergoes conformational exchange between open (T) and closed (R) states in solution. However, in the closed state the ligand-binding site is completely occluded, and it is impossible for ligands to bind to this state. It therefore follows that binding-associated conformational change proceeds by an IF-like pathway, even though an equilibrium between the R and T structures exists in the apo- state. In this and similar cases, all four major states are populated, but kon,R≈0 and so the path through TbL dominates the reaction flux. The thermodynamic implication of CS — that there is a detectable equilibrium between R and T states — is not synonymous with its mechanistic meaning — that conformational change precedes binding. This makes sense, because in the context of a constantly interconverting ensemble of conformations, even very unfavorable Ra states will be accessed occasionally. The strict thermodynamic definition of IF, that the R conformation be unattainable in the apo- state, may not apply to any real protein (2). However, the population of R conformers may be so low and short-lived as to be undetectable. Even though a pre-existing equilibrium is not probative, a quick examination of the figure above indicates how we can distinguish between these mechanisms. In the case of CS, the rate of interconversion between T and R states in solution sets an upper limit on the activation rate, because the ligand binds to the apo-R state. At high ligand concentrations, kact = kTR because the presence of ligand probably will not alter the energy landscape of a protein it is not bound to. In this mechanism, however, koff,R is expected to be much slower than kRT. This implies that kin should decrease significantly at high ligand concentrations. In an IF mechanism, the energy landscape of the encounter complex need not be the same as that of the apo- protein. As such, in IF activation the T→R energy barrier can (and is expected to) become lower. Accordingly, if kact exceeds kTR at high ligand concentrations (3), then an IF mechanism must be at work. Because this energy barrier is variable in an IF mechanism, however, it’s somewhat difficult to predict what will happen with the R→T barrier; it might get larger, or it might not. The figure below summarizes the expectations. Hatzakis et al. report that the rate of conversion from T to R (i.e. kact) increases as PEG concentration decreases (note: in the advance online version the schemes in Figures 2 and 4 are mislabeled, but the energy diagram in 4 is accurate). The kin rate, by contrast, remains constant. If we accept their (reasonable) assumption that the energy of Ta is not affected by the lipid membrane, this indicates that the T→R energy barrier decreases in the presence of the allosteric effector. That, in turn, implies that the membrane is associated with the protein prior to the transition state, and thus that the mechanism of activation is induced fit, even though an Ra state can be observed in solution. “Conformational selection” is often used interchangeably with “pre-existing equilibrium”, but it is dangerous to employ this equivalence. The thermodynamic feature of a pre-existing equilibrium between apo -inactive and -active states does not necessarily imply that the pathway between apo-inactive and bound-active states proceeds through an apo-active intermediate. In some cases, the observed equilibrium indicates a kinetic dead-end where kon,R≈0 and the reaction flux is dominated by IF mechanisms. Hatzakis et al. studied the single-molecule kinetics of several other allosterically-regulated monomeric enzymes and found that they also showed evidence of a pre-existing equilibrium between active and inactive states. This alone, however, is not sufficient to establish activation via CS. Only a detailed examination of the kinetics can indicate whether activation uses CS, IF, or some combination of these mechanisms. 2) By the same token, apo-R states are almost certainly not exactly the same as bound-R states, so a strict version of CS is also quite improbable. 3) At substoichiometric concentrations of ligand, kact can exceed kTR because in this condition maximum activation can be reached by (rapid) binding of ligand to the existing pool of Ra, without any need to replenish Ra from Ta. The enzyme imidazole glycerophosphate synthase (IGPS) can be a bit of a lump. If you bind just one substrate it doesn’t do anything, even though its two active sites are separated by more than 30 Å. Only if the second substrate also binds does catalysis actually go at anything like a respectable rate. In a recent paper in Structureresearchers from Yale report evidence that this change of pace results from a change in dynamics. 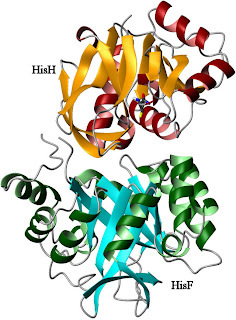 IGPS consists of two different protein subunits, HisH and HisF (above). HisH performs a relatively standard hydrolysis of glutamine, producing ammonia and glutamic acid. The ammonia molecule is then used by HisF as part of a cyclization reaction involving a weird nucleotide called PRFAR (with an IUPAC name that’s just too long to bother with). The products of this reaction feed into the biosynthesis of histidine (as you might guess from the name) and the purines. In an example of poor planning, however, the active sites for these two reactions are separated by a great distance. Glutamine hydrolysis takes place near the interface between the proteins (which bind to each other with nM affinity), while PRFAR cyclization takes place at the far end of HisF (near the bottom of the image). This is too far for the ammonia to be efficiently transferred by any direct action of the enzyme itself. Therefore, the reaction proceeds when the NH3 travels down the β-barrel of HisF to its distant active site (see image below left). The upside of this system is that ammonia gets where it needs to go. The downside of it is that unless the hydrolysis reaction only occurs when PRFAR is in position, this enzyme will be a little ammonia factory, costing the cell a fortune in nitrogen. Therefore, the cleavage reaction must be tightly regulated. Enzymes can deal with this kind of demand in two ways. The first is to make the binding of one substrate depend on another. This is called K-type allostery because what is changed is the affinity (KD) of the enzyme for its substrates. Alternatively, the rate of catalysis can be altered, which is called V-type allostery because the velocity (Vmax) of the reaction is changed. IGPS uses the latter approach. When glutamine binds, NH3 gets eliminated at a stately pace of about 10-3 /s. If PRFAR also binds, however, HisH starts firing NH3 down the barrel at about 5 /s, which may not win many races but is a substantial enhancement. The question, then, is how the HisF active site lets the HisH active site know that PRFAR has arrived, when they are separated by more than 30 Å. Examining the enzyme complex in the presence of various ligands, James Lipchock and Pat Loria find evidence that changes to the dynamics of HisF are responsible for this communication. towards the HisH active site. The authors start by examining the energetics of PRFAR binding to IGPS. This event is endothermic, with an unfavorable enthalpy of binding. However, the entropic contribution is sufficiently large to overwhelm this effect. This could indicate a major increase in conformational entropy upon binding, or it could just be related to the behavior of water. Lipchock and Loria found that PRFAR binding to form the ternary complex had similar energetics. Of course, you can’t form a ternary complex with actual substrates for very long, because catalysis would occur and change the affinities. They dealt with this using acivicin, a glutamine analogue that binds covalently to the active C84 of HisH. Unfortunately, these thermodynamic data aren’t particularly illuminating, so the authors proceeded with a high-resolution examination of the system. Because IGPS is a bit over 50 kDa in size, they chose to use methyl groups as their primary probes. Most of the remaining work in the paper uses ILV (Isoleucine, Leucine, Valine) labeling, which takes advantage of the favorable relaxation properties of the methyl groups of those side chains. Lipchock and Loria started by examining the enzyme in its apo- state using relaxation-dispersion experiments. As I’ve mentioned before, these experiments detect exchange between different conformations on the microsecond to millisecond timescale. If this represents motion between two well-defined states, then the apparent relaxation rate at a given refocusing field strength will be a function of total process rate (kex = kab + kba), the populations of the two states (pa and pb), and the chemical shift difference between them (Δω). If the exchange rate is fast on the NMR timescale (meaning that kex >> Δω), the last three parameters can be combined into a factor called φex. This is how the authors fit their data, a choice they justified by stating that fitting the data to the full Carver-Richards formula (SI equations 8-18) gives similar answers for kexbut yields large errors in the populations and chemical shift differences. However, most of the dispersion curves look like data from slower exchange regimes. Unfortunately, I’m having trouble reconstructing their fitted curves from the parameters in any convincing way, in part because the equations in SI contain a few errors, so it’s difficult to discuss where the vulnerabilities in this fitting procedure lie. Using their approach, Lipchock and Loria find that only a few residues are experiencing conformational exchange, and they believe that the motions are primarily local. I’m not so certain on that point: a quick examination of SI Table 1 indicates that all but two methyls have kex within error of 150 /s or so, which may indicate that most residues belong to a single process. However, most of the residues with similar fluctuation rates don’t physically group in any obvious way (although V100 and V79 are adjacent). Regardless of the particulars, it’s clear that in the apo- state, few of the methyl groups in HisF are experiencing any kind of µs – ms fluctuation. Binding of acivicin to HisH doesn’t change this too much. Within the bounds of the fitted error, the extracted dynamics parameters are the same for many residues. The exceptions are the adjacent residues V79 and V100, and L153δ1, which has an odd halving of both rate and the combined parameter. Also, as you can see in SI Table 2, the R2° values in this state are significantly lower than apo- IGPS. This is difficult to interpret without knowing exactly how the experiment was performed; they could represent additional ns fluctuations, the removal of some very fast global process, or simply different deuteration efficiency. However, some methyls do not appear to have large changes in their R2° values (e.g. V56γ2, I73δ1, L94δ1). Most of the spurious factors that would give rise to the observed changes in R2° should affect all residues more or less equally; the lack of uniformity suggests this may be worth following up on. When Lipchock and Loria added PRFAR to the system, all hell broke loose. Many of the amide groups in the protein had their signals broadened beyond the detection limit, indicating conformational exchange on the intermediate timescale. In addition, a large number of methyl groups showed evidence of conformational exchange. Here the fluctuation is obviously a genuinely incoherent one. Not only do the fitted kex values vary wildly across the protein, they also have poor fitting characteristics (including fitted errors greater than 100%), and enormous differences between adjacent methyls on a side-chain (e.g.L153δ1,2). This suggests that the two-state model might be inappropriate, which is what you would expect for widespread and incoherent fluctuations among contiguous residues. For atoms that are in close proximity, a two-state exchange model presupposes some kind of coherent fluctuation, because in a chaotically fluctuating system, well-defined, relatively long-lived states don’t exist. Of course, in the absence of well-defined, relatively long-lived states, it’s difficult to understand what all this motion does. It’s therefore very interesting that when acivicin and PRFAR are bound to the enzymes, forming the ternary complex, all the methyls can be fit to a single conformational exchange process with a rate of about 225 /s. That is, the formation of the ternary complex causes the dynamics to become a global (or nearly so), coherent process. So, what does all that wiggling accomplish? 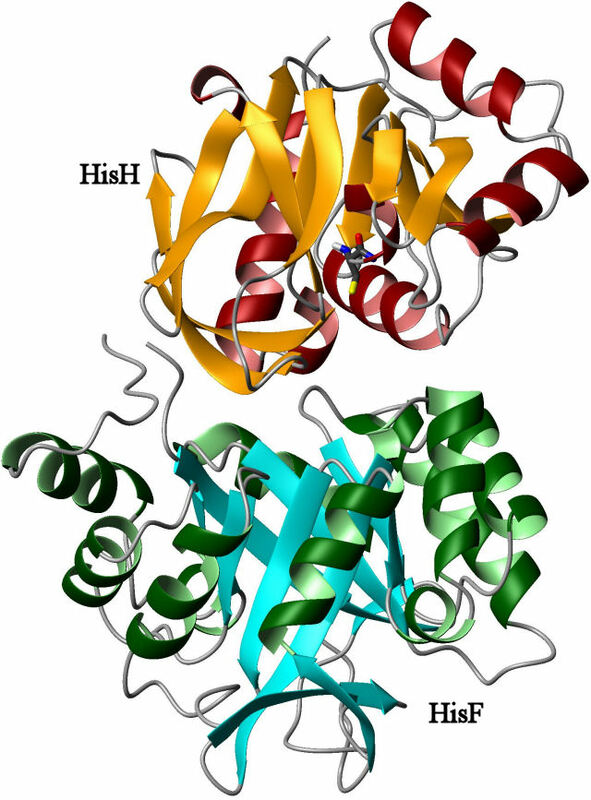 Lipchock and Loria point out that in the apo- structure of HisH, the backbone amide group of V51 is improperly positioned. Its role in the reaction is to stabilize the negatively charged oxygen in the tetrahedral intermediate of the reaction. However, as you can see in their Figure 9, this amide points away from the reactive cysteine in the apo- state. In order to fulfill its function, this loop must rotate about 180° from the apo- position. The authors hypothesize that the coherent fluctuations of HisF in the ternary complex are transmitted to the active site of HisH and make it possible for this rotation to occur. Consistent with this model, the binding of PRFAR to HisF causes the amide resonance of G50 to broaden out due to chemical exchange. The titration (in Figure 9) looks a little strange; it’s not clear why the peak shifts between 4% and 20% saturation, or why no points are shown from 33% to 100%. While neither glutamine nor acivicin was bound in this experiment, it at least confirms that information about PRFAR binding to HisF can reach the binding site of HisH as changes in dynamics. This might seem like an odd mechanism, because this particular loop in HisH has no points of close contact with HisF in the crystal structure. By contrast, there appear to be several points of contact between HisF and the region around catalytic triad members H178 and E180, so one could argue that they are more likely responsible for the observed effect. In the apo- state, however, the backbone amide of V51 is hydrogen-bonded to the carbonyl oxygen of P10 (see figure on the right). Fluctuations in that loop, perhaps transmitted from HisF through contacts to HisH residues N12, N15, R18, and R22, could destabilize that bond and encourage rotation. The HisF residues I93 and I73, which are part of the dynamic network in the ternary complex, lie in this region. However, the bulk of the contacts are to the backbone, and alanine dynamics (reflective of main-chain motions) do not appear to have been studied in the ternary complex. A good look at HisF A70, A89, and A97 when both ligands are bound may give some insight into whether this is the transmission point, and some data on the ILV residues of HisH in this region would also help examine this hypothesis. It might also be valuable to mutate P10 to something more flexible to see if the regulation is altered. The authors point out that the fluctuation rate is many times larger than kcat. The relevant rate, however, is the rate at which the complex enters the catalytically-competent state, which is probably much lower than the total kex. Here, a fit to the full Carver-Richards equation yielding populations would have been enormously valuable. It’s therefore possible (but not yet proven) that the HisF fluctuations are rate-limiting for HisH catalysis, which would after all be an easy way to achieve V-type regulation. This is another case in which dynamics allow a protein to reconcile incompatible functional requirements. IGPS must be nearly inactive in the absence of PRFAR, yet still achieve a significant rate enhancement in its presence. Although much work remains to confirm the hypothesis that the dynamics are solely responsible, it appears that fluctuations in HisF may enable HisH to adopt an alternate conformation that is catalytically competent while generally favoring the inactive structure. In the Monod-Wyman-Changeux model for cooperative binding, proteins exist in an equilibrium of low-affinity and high-affinity states in solution, absent any ligand. In this view, although it may appear that the binding of a ligand causes a conformational transition, it actually stabilizes one conformation from a pre-existing equilibrium. 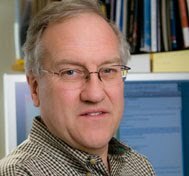 In the past several years, advanced NMR techniques have yielded increasing evidence that these structural equilibria exist for a number of proteins, suggesting that this model for linkage between conformational change and binding may be quite general. An upcoming paper in the Journal of Molecular Biology (1) is typical of such findings. Farber and Mittermaier studied the behavior of a homeodomain, a small, all-helical domain that typically binds to DNA, often in concert with other homeodomains. In particular, they were interested in the homeodomain of PBX1 (PBX-HD) which binds DNA cooperatively with a homeodomain from HOXB1 (HOX-HD). The domains interact with the DNA target and with each other. Peptides representing the binding site from the HOX-HD bind detectably to PBX-HD only in the presence of the target DNA, suggesting that the two binding sites communicate. The third helix of the PBX-HD is likely to mediate the allostery since it’s involved in both binding interactions, but it’s not clear from the available structures how this would happen. Additionally, there is a C-terminal sequence, with no defined fold in the free structure, that forms a helix in the ternary complex. It does not interact directly with the DNA, but removal of this extension decreases the affinity of PBX-HD for DNA and weakens the cooperativity between PBX-HD and HOX-HD. Helix folding has a low energy barrier, so it is reasonable to suspect that this helix could form even in the absence of DNA. Farber and Mittermaier examined this possibility using a technique I have often discussed on this blog: CPMG relaxation dispersion. As you may recall, this technique is sensitive to fluctuations between states (chemical exchange) that persist for microseconds or milliseconds. One can in principle determine the rate of exchange (kex), the population of each state (pA, pB), and the chemical shift difference (|Δω|) between them, although if the motion is too fast or too slow only composites of some of these can be reliably determined. When they performed the experiment, the authors found that residues throughout PBX-HD had significant broadening, indicating chemical exchange and suggesting that the protein does not spend all its time in one folded state. The relaxation-dispersion profiles they obtained at 10 °C and 15 °C were in the intermediate regime, where all three of the aforementioned parameters can be determined. For the C-terminal extension, the |Δω| determined by fitting the relaxation-dispersion data were linearly correlated with the chemical shift change that was observed in an HSQC upon binding (|Δδ|). The correspondence wasn’t exactly 1:1, but this is still reasonably good evidence that the helix is folding independent of binding. The authors used the |Δω| from the 10 °C fits to pull populations and rates from the experiments performed at higher temperatures, where only a composite parameter can be reliably determined (due to the speed of the fluctuation). Arrhenius plots derived from these data indicate thermodynamic parameters that are consistent with the folding of a single helix, again supporting the proposition that the C-terminal helix can fold on its own. Numerous residues in the folded portion of the domain also experienced chemical exchange, which could mean that the helix is not the only thing undergoing a structural transition. The authors fit these residues individually, then tried again while fixing kex to the value determined from the helix behavior. The latter fits were not much worse in terms of their residuals than the floating fits were, so the fluctuations here could reasonably be seen as consistent with the helix-folding fluctuation. 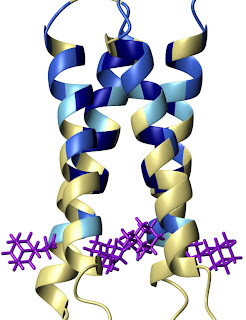 If this is so, then removing this unstable helix should quench the dynamics in the folded part of the protein. This turned out to be the case — when the helix was removed, the dispersion curves for residues in the folded part of the protein became flat. This reinforces the case that the dynamics detected in the folded domain are related to the folding of the helix, and therefore represent an excursion to the “bound” structure for ligand-free protein. Farber and Mittermaier note that for residues in the folded portion of the domain, the |Δω| determined through the CPMG analysis does not appear to agree with the |Δδ| observed upon binding DNA. From this they conclude that the conformational change in solution is actually going to some unknown third state that is different from both the free and bound structures. I disagree somewhat with this interpretation. Because the ligand (in this case a piece of double-stranded DNA) is large relative to the protein and possesses substantial negative charge, there’s a significant possibility of long-range electrostatic effects on the chemical shift of the PBX-HD. That is, the protein’s bound state might have different chemical shifts free in solution and bound to the ligand even without any major conformational changes. If this is the case, the |Δω| will correlate best with |Δδ| for residues that are far from the interface. Probably the structure sampled by the free protein is not exactly the same as the bound structure, but I think further data would be needed to determine whether the alternative structure in the free state differs significantly from the bound structure with DNA. The uncertainty about the alternative structural state of the free protein makes it more difficult to make a firm argument about whether the binding mechanism more closely resembles conformational selection or induced fit, or whether it’s some kind of middle ground between the two. Although it’s suggestive, the observation of a structural equilibrium in the free state does not actually indicate how binding occurs. Moreover, because this is a complicated ternary complex, it is possible that, say, the protein-binding mechanism is conformational selection, while the DNA mechanism is induced-fit. This latter possibility might seem more sensible in light of existing studies indicating that long-range (e.g. electrostatic) interactions may predispose a system to induced-fit binding. Complications aside, these data seem to support a model in which the PBX-HD transiently adopts the bound conformation in the absence of ligand. Binding of the PBX-HD domain to DNA shifts its population towards the state that is the minority in solution. This new structure has high affinity for the HOX-HD, promoting the formation of the ternary complex. In principle, binding of the HOX-HD to PBX-HD could precede DNA binding by both modules, but the interaction between these proteins appears to be weak in the absence of DNA. However, proving that the excursion to the bound (or near-bound) PBX-HD structure represents an actual intermediate in the binding process rather than just an interesting fluctuation on the side will require some determination of the binding kinetics in various conditions. Most people never learn about an actual scientific controversy. Almost every “controversy” that bubbles into the public eye is manufactured, often reflecting social or ethical differences rather than genuine disagreements between experts about how different models fit to reality. Actual scientific controversies tend to be highly technical, and often concern points that lay people find to be esoteric. That doesn’t mean that the issues involved aren’t important, or that they’re even difficult to understand. One controversy that has unfolded over the past few years and now may be over relates to a seemingly simple question. Where do adamantane drugs bind to the influenza A M2 channel? 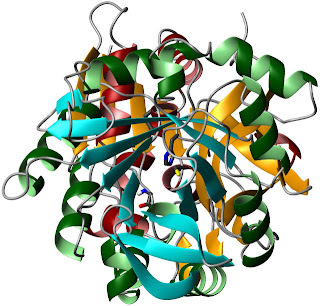 The M2 proton channel plays an essential role in the life cycle of the influenza virus. The activity of the channel could be blocked, at least in influenza A, by drugs called adamantanes, including amantadine and rimantadine. Unfortunately, these antiviral drugs have been fading in efficacy due to the spread of an S31N mutation that interferes with their binding. On January 31, 2008, two articles appeared in the scientific journal Nature showing adamantanes bound to the M2 channel. Unfortunately, the structures had different answers about where the drug was bound. 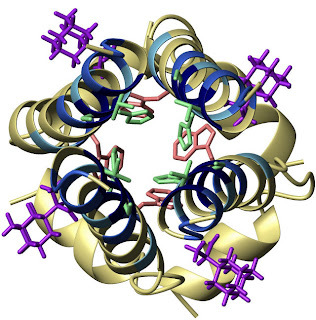 The X-ray crystal structure from Bill DeGrado’s group at the University of Pennsylvania placed amantadine in the center of the channel’s pore, suggesting a simple pore-blocking model (PBM) for inhibition. The NMR structure from James Chou’s group at Harvard University located rimantadine on the outside of the channel, ultimately giving rise to an allosteric, dynamic quenching model (DQM) of adamantane activity. As outlined in my previous post on the M2 channel, there was conflicting functional evidence as to which site was actually relevant in vivo, and reasons to doubt the conclusions from both structures. Since that time, several papers have been published that substantially clarify the issue. At this point, the evidence strongly supports the PBM as an explanation of adamantane activity in vivo. Sure adamantanes bind there, but does it matter? The direct observation of NOEs, even weak ones, between the adamantane and the protein proved that the drugs were binding at the DQM site, but there were some significant areas of concern with this finding. The greatest worry was due to the extremely high concentration of ligand used in the NMR experiment. This opened up the possibility that the DQM site was a low-affinity site that would not see binding under normal circumstances. Because both models had explanations for the efficacy of the S31N mutation, the only way to address the question would be to make mutations that would abolish binding at the DQM site and see if adamantanes were still effective. Because aspartate 44 was proposed to form a hydrogen bond to rimantadine, it was thought that a D44A mutation would eliminate binding, and if DQM was true, adamantane activity. This prediction was borne out by an experiment performed in liposomes by the Chou lab (6), but Robert Lamb’s group from Northwestern University was not able to replicate this result in X. laevis oocytes (4). M2 channel since the 80s. What Lamb’s group did do was test different parts of the influenza A channel for adamantane sensitivity by fusing them to the adamantane-insensitive influenza B channel. These A/B M2 chimeras should in principle have adamantane susceptibility if the legitimate binding site got imported from A to B. Their first results in this experiment were somewhat inconclusive. Adding the N-terminal portion of the A channel to the C-terminal portion of the B channel (essentially sticking the PBM site into B M2) created a chimera that was somewhat sensitive to amantadine treatment, but the effect was nowhere near what occurred for WT A channel (4). Subsequently, Lamb’s group expanded these experiments to add a little bit more of the N-terminal sequence to the chimera, which then almost perfectly matched the WT A channel’s susceptibility. Notably, when they made the opposite chimera that incorporated the DQM site from A into the B channel, only a very slight inhibitory activity was observed upon addition of amantadine (5). While the conclusions that can be drawn from the chimeras are limited by their particularly odd provenance, the fact that transplanting the PBM site from one channel to another confers adamantane susceptibility suggests that this is the functional binding site. An upcoming paper in PNAS clarifies the picture somewhat using surface plasmon resonance (SPR) (7). This technique detects the binding of a ligand as a change in physical force exerted by a protein tethered to the surface of a gold chip. 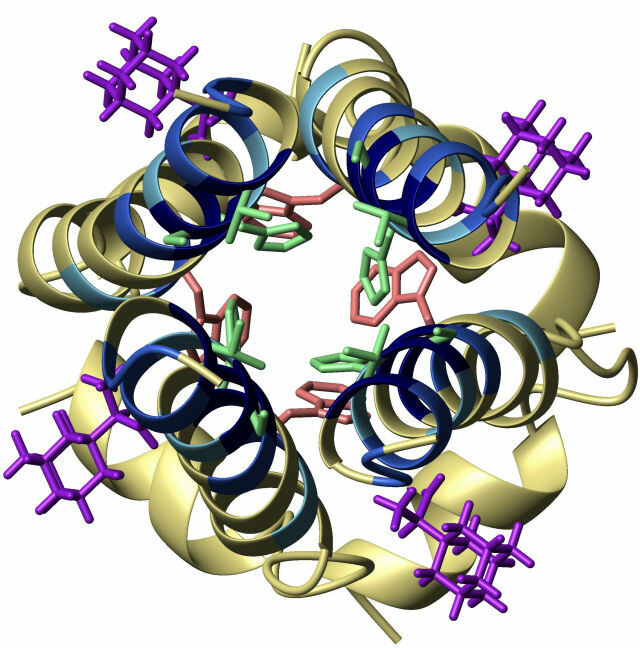 In this case, the tethering was mediated by a DMPC liposome. This was a tricky experiment because adamantanes like the greasy portions of lipid bilayers, so they can bind to the liposome itself. Rosenberg and Casarotto, however, were able to control for this effect. 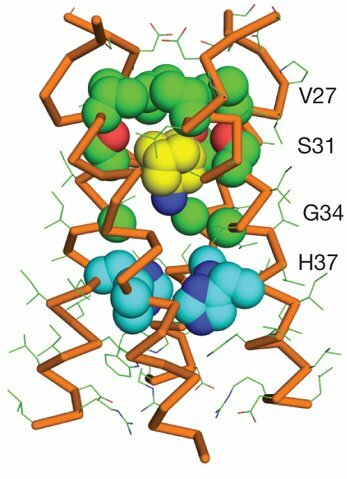 Their SPR experiments detect two distinct adamantane binding sites on M2 with vastly different affinities. 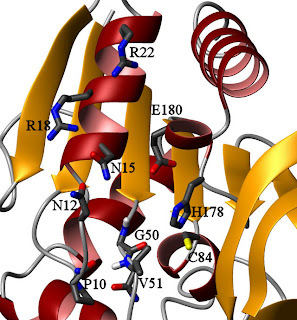 Rimantadine binding at the high-affinity site could be abrogated by S31N and V27A mutations, but not a D44A mutation. At the low-affinity site, rimantadine binding could be knocked out by a D44A mutation or an S31N mutation, but not a V27A mutation. This result indicates that both binding sites are functional (and, incidentally, that the S31N mutation does indeed exert an allosteric effect on the DQM site). However, the authors note that the adamantane concentrations used in actual treatment are too low to significantly populate the low-affinity site, given the dissociation constants they calculated. This argues that the DQM site is irrelevant in vivo. One of the problems with the PBM was that the crystal structure that supported it was unsatisfactory in a variety of ways. The structure was made using a construct that consisted of only the transmembrane segment of the protein. This construct could not be reconstituted in micelles, and functional experiments showed that it was not very similar to the WT in terms of its activity. In addition, the extra electron density in the pore could not be unambiguously assigned as amantadine. 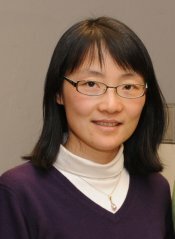 In a paper from February of this year, the DeGrado group collaborated with Mei Hong’s group at Iowa State University to produce a structure of amantadine bound to M2 using solid-state NMR (2). An important advantage of this approach is that one can take spectra of proteins embedded in a membrane without penalty, because there is no requirement for the protein to tumble freely. While there are some trade-offs in terms of resolution and the kinds of data that can be obtained, biomolecular solid-state NMR can help us answer some very tricky questions. The approach proved to be especially fruitful here. Cady et al. used a technique that allowed them to determine whether the amantadine was near a particular residue, by labeling residues with 13C and the amantadine with 2H. If a 13C nucleus is coupled to a 2H nucleus by a dipolar interaction, a pulse that dephases the 2H nucleus will affect the 13C nucleus in a distance-dependent manner. When Cady et al. made samples at a ratio of one amantadine per channel, they found that the signal from S31 was significantly broadened, but that from D44 was not, proving that the amantadine is close to S31 under these conditions. The D44 signal was affected at higher amantadine concentrations, but never to the same degree as the S31 signal. Other residues at the PBM site were also affected by the presence of amantadine. Using an alternative version of the REDOR experiment, Cady et al. were able to generate distance constraints and, in combination with other data, generate a structure for the channel with amantadine bound (see their figure at right) (2). Note the residues that are close to the amantadine in this structure: V27, S31, G34, and H37. This will be important in a minute. The Cady et al. paper has several advantages over the DeGrado group’s original crystal structure. The first, and most important, is that the protein was reconstituted in DMPC vesicles rather than OGP bilayers. The lipids themselves, and the vesicle structure, more closely mimic the likely environment in vivo than the crystal conditions, and they are also more biologically-relevant than the DHPC micelles employed in Chou’s original determination. In addition, the pH of 7.5 matches the experimental conditions used by Chou and allows for a direct comparison of results under conditions where the channel’s conformation should in principle be the same. The REDOR results provide unambiguous evidence that amantadine binds preferentially in the pocket for this construct. Their observation that amantadine has approximately 100-fold higher affinity for the PBM site, but can also bind the DQM site, agrees nicely with the functional data, especially the SPR results. Support for an allosteric mechanism? However, Cady et al. still used the truncated construct that possesses significantly altered activity relative to WT, which brings us to an upcoming paper in JACS by Andreas et al. (1). Chou’s group collaborated with Robert Griffin’s group at MIT to map the chemical shifts of a somewhat larger construct of M2 that is known to have relatively normal activity. The longer construct is also known to form a fairly stable tetramer, and this may have improved its spectral properties. The construct was inserted into membrane bilayers that were lyophilized for the NMR experiment, with and without rimantidine present. The chemical shifts of 15N and 13C nuclei of residues in the transmembrane helices were compared between these two states as a way of localizing the adamantane binding site. As Andreas et al. show in their figure 2 (recapitulated below in a slightly altered fashion), the chemical shift changes in response to the binding event are quite widespread. The authors argue that this observation favors an allosteric inhibition mechanism. That may well be true, in a sense, but unfortunately that does not mean that the observation favors DQM. The binding of a ligand generally alters the chemical shifts of a protein by changing its structure, reshaping the arrangement of bond angles that dictates the electron distribution around the relevant nuclei. It is of course possible that a small change in the protein’s conformation at the binding site propagates into a large change elsewhere, but this is not typically observed. The most reasonable interpretation of chemical shift changes (Δδ) upon ligand binding is that the largest shifts observed are nearest to the ligand, while the smaller shifts are farther away. The original version of figure 2 presents the data in a fairly simple way, and does not distinguish very large changes from relatively small ones. So, I made a new version of the figure for you, where I’ve taken the additional step of scaling the color according to the magnitude of Δδ. This adaptation of the Andreas et al. figure, shows the NMR micelle structure (PDB code: 2RLF) with purple rimantadine at the DQM binding site and the helices colored in blue according to the Δδ. This was done very roughly, by eyeballing the graphs to the left in figure 2, scaling the Δδ based on the nucleus measured, and adding it all up across all three nuclei. The more intense the blue, the larger the Δδ. It should be immediately apparent that the largest chemical shift changes are located a substantial distance from the DQM site (although there are some smaller changes near that site). What’s perhaps less immediately obvious is that the largest chemical shift changes belong to residues located in the pore. To make this point more clear, check out the figure below and to the left. This is the same structure, that I have now tilted so we are looking down the barrel of the channel. 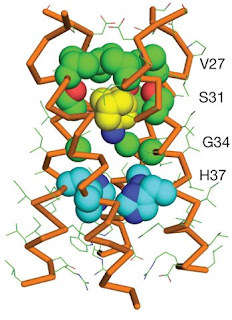 The side chains of the four residues with the largest chemical shift changes (V27, S31, G34, H37) are shown in light green for contrast (obviously there’s nothing for G34). Three of them are sticking into the pore in this model (G34′s Cα faces the pore); the fourth is S31. You might recall that the structure from Cady et al. (above) puts all four of these large Δδ residues right next to the ligand. The largest chemical shift changes in response to rimantidine binding occur near the proposed PBM site and far from the DQM site, and the residues most affected are those facing the pore. Andreas et al. argue that this information is insufficient to positively localize the drug, due to the large chemical shift change at H37 Cα, but this doesn’t seem particularly convincing. The concentration of large chemical shift changes at the N-terminal end of the channel strongly argues for the ligand binding in this region. As for the significant Δδ at H37, the observations could quite possibly be due to ring-current effects from the repositioning of the adjacent tryptophan side chains (light red in the figure to the left). We know that binding of adamantanes has at least some effect on W41 thanks to Czabotar et al. (3), who measured adamantane binding by observing changes in intrinsic tryptophan fluorescence. Of course, changes in fluorescence are a very general indicator of structural or dynamic change, but the previous finding supports the possibility of interpreting the H37 observations as side-chain effects rather than ligand proximity. In contrast, there is no such explanation for the significant chemical shift changes at the N-terminal end of the channel, which has no aromatic residues. The significant Δδ in this region must be due to rearrangements of these residues themselves, rather than long-range effects or ring currents. Thus, the most plausible model explaining these data remains one in which adamantanes bind near V27 and S31, propagating some kind of structural change to W41, rather than the other way around. In this regard, I agree that the data from figure 2 establish that adamantane binding has an allosteric effect. These data, however, do not support the DQM Chou proposed previously. The DQM hit its high-water mark with the Pielak et al. PNAS paper back in 2009 (6), in which the model’s prediction that the D44A mutation would significantly alter adamantane sensitivity was borne out by experiments in liposomes. Since that time, however, the evidence has started to weigh mostly against it. The D44A results could not be replicated in X. laevis oocytes, and lovely chimera experiments in this system demonstrated that the N-terminal region of M2 was critical for adamantane sensitivity (4)(5). Live viruses remained sensitive to adamantanes even if they were reverse-engineered to have the D44A mutation. Rosenberg and Casarotto showed that the D44A mutation only affected binding at absurdly high rimantadine concentrations (7). Finally, the Cady et al. study provided unambiguous evidence for adamantane in the pore of the channel (2). In light of these findings, only a crystal-clear result in favor of the DQM could really save it. Although their findings convincingly illustrate an allosteric effect from rimantidine binding, Andreas et al. do not provide that result. Even their own chemical shift data seem to support the PBM model. Of course direct dipolar couplings would provide a totally unambiguous answer as to the location of the rimantidine, but in light of our existing knowledge about the system, that experiment doesn’t seem necessary. At this point there is no serious reason to doubt that the physiological inhibition of M2 channel results from adamantane drugs binding to the pore. The papers cited in this article represent decades of man-hours and significant amounts of money spent in resolving what might seem like an esoteric point. Given the enormous effort that went into resolving the seemingly simple question, you might be tempted to ask what went wrong. The answer is, “nothing”. This is how the scientific process is supposed to work. Two groups came at the same problem in different ways and got different answers, which is hardly a surprise because no experiment is perfect. More experiments were carried out to determine which model best represented the physical reality. Eventually, the weight of the evidence strongly supported one model over the other. The best data we have right now really point to a single conclusion. The process succeeded, and nobody needed a superior court judge or a congressional hearing. That doesn’t mean we can’t take some lessons from the experience. Most prominent among these is that we must have serious reservations about NMR structures derived from proteins bound to or inserted in micelles. What we know about the M2 channel tells us that adamantanes prefer to bind in the pore. That they did not do so (or at least, could not be detected doing so) in the micelle-based structure suggests that something about the micelle itself made that impossible. We know that the forces exerted on proteins by membrane curvature can be substantial, and the structure of a micelle is very unlike the structure of a cell membrane. Solution NMR in bicelles may yet prove to be a superior approach for some systems, but in this case it was solid-state NMR that provided the vital evidence. Solid-state has its own set of limitations, but it’s clear proper membrane context is absolutely vital to getting good answers about membrane protein structure and function. Knowing the actual binding site of adamantanes may prove to be very important in aiding the design of alternative drugs that achieve the same inhibition of the channel. The papers from the DeGrado and Hong groups have already made several interesting recommendations in this regard. Even what has been learned about the remote site may not be fruitless. Though it is not the source of the physiological activity of adamantanes, several experiments have made it clear that there is some kind of allosteric interaction between S31 and the DQM site. It may be possible to attack M2 through this site with a specifically-designed high-affinity drug, even if adamantanes themselves don’t work this way. If that proves to be the case, then this will be the best kind of scientific controversy: one where we learn something important from both sides. Can videogames help treat amblyopia? » Conformational Flux | industry, blog, iphone, app, creative, games, programming, project, various, criminalminds on Can videogames help treat amblyopia?